Are German shepherds known to be aggressive? HomeAre German shepherds known to be aggressive? Well, yes German shepherd dogs are known for aggressive nature and tendency. And their aggressive behavior makes them a brilliant guard dog, military or police dog. They have a keen sense of smell which is very useful to find or detect something. However, the aggressive nature of your German shepherd dog can be dangerous if you encourage them. A German shepherd is considered as the best guard dog, however, if you do not train them with proper guard technique then their aggressive tendency become dangerous for everyone. In this article, we will help you to understand the behavior of your German shepherd. The aggression of a German shepherd dog is completely depending upon his strength. The aggression of a German shepherd dog has so much of strength that his single bite can cause anyone a high physical injury or serious bone damage. This breed of dogs is not familiar with the guest and they usually possess in aggression. They always dislike unwanted guest and you can observe this because they usually bark on the unwanted guest. If you want to reduce the aggression of your German shepherd dog then you have to train him from his young age. 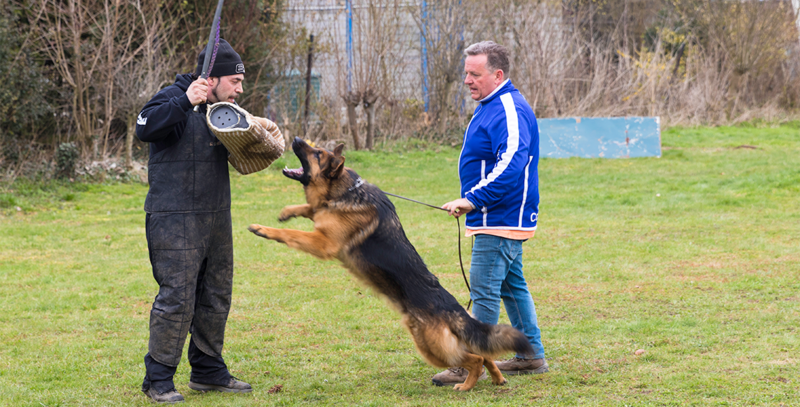 This is really good for you because if you have started the training of your German shepherd dog at a young age then you can control him very easily. Your training tips and tricks affect the behavior of your German shepherd dog. if you train them some with positive vibes and tell them how to behave positively towards the guest or friends then the aggression of German shepherd does not create an issue for you. Once you have started training then you can control the anger and aggression of German shepherd and teach him how to keep calm. So, if you are still thinking the German shepherd is an aggressive dog then you should always remember that aggression completely depends upon how you treat your German shepherd dog.